A bull jumped into the stands at a bullring in northern Spain injuring up to 40 people, according to officials. 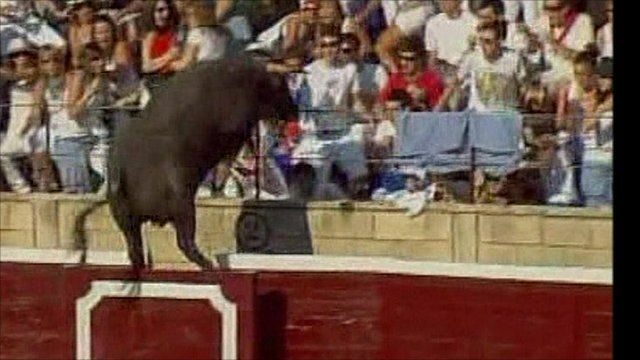 It happened in Tafalla, when the animal leapt over the fence and climbed up the stairs of the stands, knocking people over. A 10-year-old boy suffered stomach wounds while another spectator was gored in the back. The other injuries were minor. Officials later tied a rope around the bull to bring it under control. The animal was removed using a crane and later killed. Spectators were watching a contest of "recortadores", where participants attempt to dodge the bull as it runs frantically around the arena. The incident comes as the country is split over whether bull fighting should be completely outlawed. Last month Catalonia became the first major Spanish region to ban the deadly sport.